|Thomas (Tom) Akers, b: 1942 is an award winning Virginia artist whose family has long standing roots in that state and has included some noted painters. He studied art and painting at American University, Washington, DC; and has a background as an illustrator and a forensic artist. Although having a continuing personal occupation with fine art, he nevertheless returned relatively late to its painting in earnest. Usually painting in watercolors and acrylics, his works are realistic but reflect the artist's particular regard for the Impressionist and American Ashcan schools in both his choices of subject for paintings and their rendering. Works by the artist are in private and corporate collections in the United States and England. 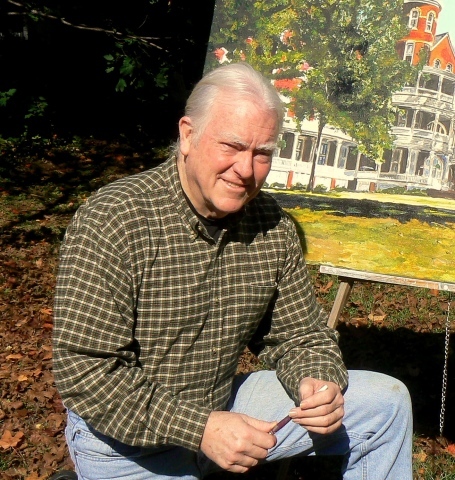 He is currently represented by the Atlanta Art Gallery in Atlanta, Georgia and Studio Eleven in Lexington, Virginia. The artist is also a current artist member of the Academy of Fine Arts in Lynchburg, Virginia and is listed in the Artist's World Directory. Originally from Prince William County in Virginia, Tom now resides with his wife, Jo-Anne in Buena Vista, where the southern part of the Shenandoah Valley begins its climb eastward into the Blue Ridge. Buena Vista is a small community on the Maury River eclipsed by its better known neighbor, Lexington to the west. In its history it was the focal point of the Shenandoah Valley land "boom" of 1889. Many of the artist's paintings are drawn from here; and are of the ordinary life and history of the people living in the haunting beauty of the surrounding towns and mountains.